This metal deck project was a gas! | Grunau Company, Inc. This metal deck project was a gas! 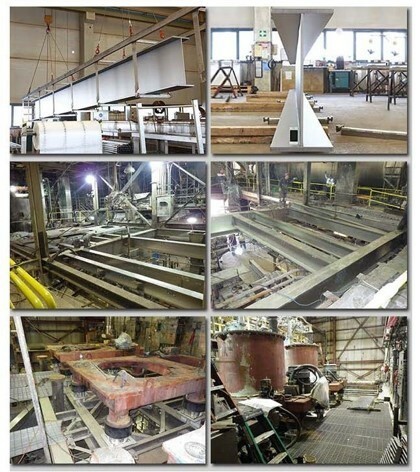 Grunau Metals fabricated and delivered a new metal centrifuge deck and compaction deck for Dakota Gasification Company in North Dakota. This plant uses a coal gasification process that produces synthetic natural gas. In turn, that gas is used for heating and making energy. They also produce fertilizers like ammonium sulfate and anhydrous ammonia, plus other industrial chemicals, but with far fewer emissions than traditional processing methods. Over time, the corrosive nature of some of these products have damaging effects to the structural steel at the plants. The North Dakota plant had been in continuous operation since 1995 and therefore in a state of disrepair. It needed to be retrofitted with new corrosive resistant steel. Timelines were very tight considering a 1-month plant shutdown like this happens only once every decade. The metal deck project was one of several major facility and safety upgrades happening at the same time. The massive stainless steel beams needed for the retrofit weren’t something you can find at a local supplier. So Grunau Metals literally scoured the earth looking for material. We ended up finding it in Switzerland. When all was said and done, the material order contained the largest 6 beams the manufacturer ever produced and the total material order weighed in at a whopping 150 tons. But locating the material was only half the challenge. Because the decks were going into a corrosive environment, there could be no cross-contamination from carbon steel to the new stainless steel beams. The Grunau Metals team stepped up to the challenge by segregating an entire existing bay just for working with the stainless material. Stainless steel laminated tables were used to fit up and assemble stairs, railings and floor components. Even heavy machinery used to handle the large metal beams were fitted with stainless steel protective measures to minimize cross-contamination. On top of all these measures, all parts were passified to remove any lingering carbon residue and contamination. Upon inspecting the Grunau Metals facility, Dakota Gasification engineers were pleased with our fabrication processes and material protection measures. The 8,616 square feet of production deck steel was fabricated, delivered and installed without issue. According to plant managers, Grunau Metals’ fabrication processes utilized on the front end to ensure negligible cross-contamination produced a finished product that is outperforming that of previous fabricators.